When you grow up riding dirt bikes in Colorado, you get a good feel for what a decent bike is. 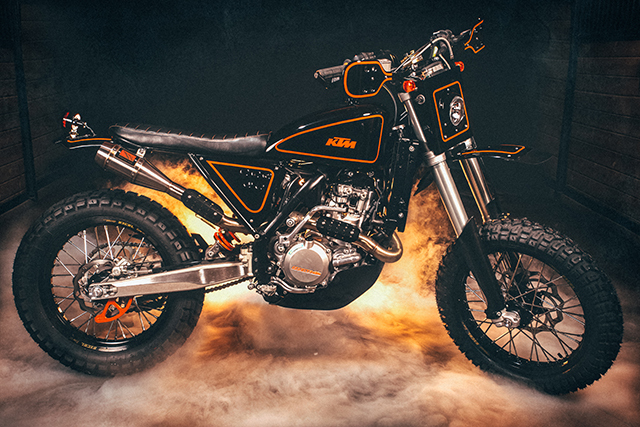 That’s where the builder of this KTM custom started out, stirring up the dirt on the trails of the American wilderness. With a build brief based on a Roland Sands design, this 2012 KTM 500EXC has been given a full work over, while retaining the reputation this model has to be thrown around on the dirt. 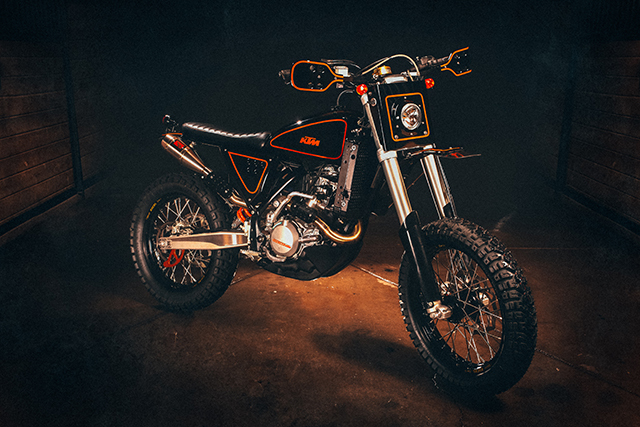 Built by Cab Moto for an ex motocross rider, as Casey the builder says himself ‘I have a tendency to want to turn street bikes into dirt bikes and dirt bikes into street bikes. I guess they turn out somewhere in the middle. Which is very functional for where I live’. This Austrian trailblazer definitely is the machine for taking on those dirt roads, as well as the ability to ride the tarmac to get to them. 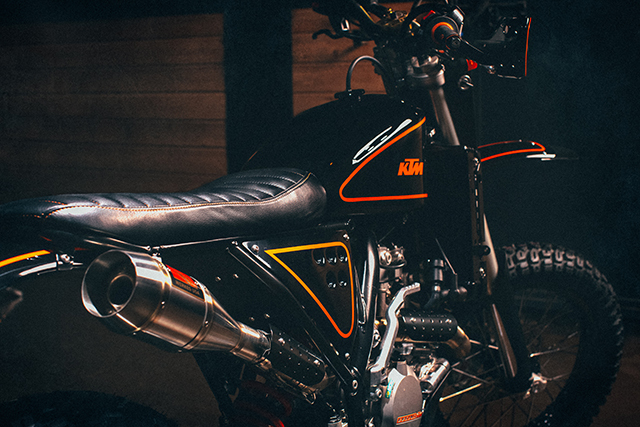 The build began when Casey had his next door come over with a picture of the Roland Sands/Kurt Caselli KTM and a fresh 500EXC with only 20 hours on the clock. With the direction set for the way the build was to go, the practically new bike was stripped of it’s plastics and fueltank, then the factory sub frame given the heave ho. A new, softer angled sub frame was manufactured and mounted, along with new fenders and bracketry. From there, Casey set about the task of fabricating a new fuel tank. Which turned out a little harder than he originally thought because he had never done a fuel injected bike before, due to a need for machined parts to complete the build process. Once the tank was mounted, a new battery and electrical junction box was fitted to the frame. 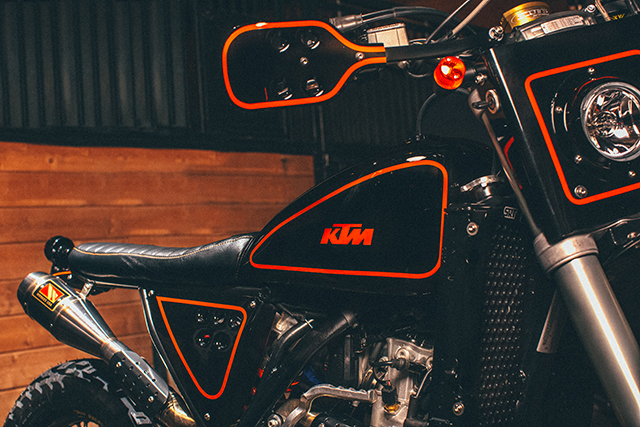 The ubiquitous trimmer, Ginger of New Church Moto, produced the immaculate orange stitched leather cushion, sitting atop a seat pan of Casey’s own making. In relation to performance this bike is a weapon, even in stock form. As Casey said about the build ‘I was really excited to start with something this awesome’, so performance upgrades have been kept simple. The air filter is now Uni open air intake, and the exhaust system is a Werkes setup from a Yamaha R6. Rolling stock are 18 runs laced up by Woody’s Wheel Works, running Excel rims on RAD hubs. The rubber chosen for the build is Mefo Super Explorer Rubber. When it came to the paint job, Casey had a good idea of what he wanted, leaving the work in the hands of Wrench Face Motors. Thanks to their quality work, in the words of the builder ‘the work turned out better than I could have imagined’. An interesting touch to the build is that nothing has been changed that can’t easily be changed back to stock should the need/legalities arise. Built on a solid platform, this KTM trail blazer is a part of an evolution of Cab Moto’s building style. From the CL360 that was featured here last on Pipeburn, you can see how the Colorado workshop is taking their builds new and exciting places. Just like you would if you owned this bike really.